Celebrate this exciting time in your life and enjoy a bit of pampering from family and friends. 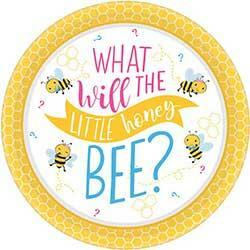 Create your perfect baby shower party with our decorative tableware and accessories. Present perfect party treatsCardboard favour boxMeasures 12cm x 10cm x 15cmWith built-in handlePack ..
Our Sunshine Yellow Favour Sticker Labels are ideal for personalise favours and gifts.Thes..
Fall in love with our old-fashioned theatre/cinema Sunshine Yellow Popcorn Favour Boxes!Whether..
Sunshine Yellow Paper Cups - 266ml (20pk)• Paper Party Cups• Each hol..
What Will It Be Hanging Swirl Decorations (12pk)• Hanging foil swirl decorations•&..
What Will It Be Paper Napkins - 33cm (16pk)• 2 ply paper napkins • ..
What Will It Bee? Paper Tablecovers 1.37m x 2.43m• Make your Baby Showertable part..
Yellow Candy Stripe Paper Bags are Ideal for Candy Buffet Sweet Treats, Wedding Favours, Shop Counte..
Yellow Plastic Tablecover - 1.4m x 2.8m • Make your table party perfect• ..